Now, when I cook during the day, I have a battle on my hands to try and not have a very cute and inquisitive small person help me out. A while back, I thought it might be fun to make some gingerbread with her. She's pretty smart (although I may be biased as her mother and because I don't know any other 21 month olds in person, she may be well behind) but she can crack an egg without getting shell into the bowl and she knows all of the kitchen equipment and that things need to go into the oven to bake (huge tantrum last time we made Rice Krispie cakes as mummy wouldn't cook them - they sat in a cold oven for half an hour in the end, just to keep the peace). If you read yesterday's blog, you will know that we went to visit my Father-in-Law on the Isle of Wight. When I wrote the blog, I hinted that the visit is more than a little stressful. But inquisitive toddler-child took things to a whole new level of stress. Before I continue, I'd just like to point out that I'm a good mother and I'm hoping that all mothers of toddlers have experienced similar near disaster. Please don't go ringing social services after reading this. Things happen when toddlers are let loose in strange places. I often wonder about the confessional nature of this blog and if I'll ever get myself into trouble. Should I just button it and talk about the food? I find the waffley bit at the start somewhat cathartic to write, but if I EVER start to sound like Liz Jones of the Daily Fail, please, someone tell me and I'll just talk about food! Back to yesterday's near disaster. Abigail has a fascination with knobs and buttons. Again my fault as I let her turn on the washing machine. Which means I often used to suddenly hear our dishwasher spring to life by itself (before it blew up the other day) and I have to watch my oven like a hawk when it's on as she likes to change the temperature. So we're at the F-I-L's house. He has an electric oven and stove with a million knobs on the front. He unpacked his hamper goodies on top of said oven. A while later, I said I thought I could smell burning. Someone who shall remain nameless, had obviously turned one of the hob rings on and set fire to the packet of biscuits for cheese. I'm just grateful that we'd not decided to go out and play in the garden or he may not have had a house to come back to! The husband had warned him that this might happen and unpacking the hamper there was a daft idea. As we only see F-I-L twice a year, I really don't think he was prepared for the whirling dervish that is our daughter and it'll probably take those six months for him to recuperate from the stress of our visit. So this morning, I was a little reticent at letting Abigail near anything that might cause further disaster. 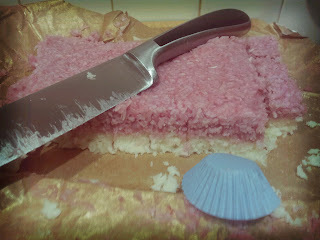 But then I felt a bit bad so we made both Christmas biscuits and Soft Raspberry Coconut Ice. 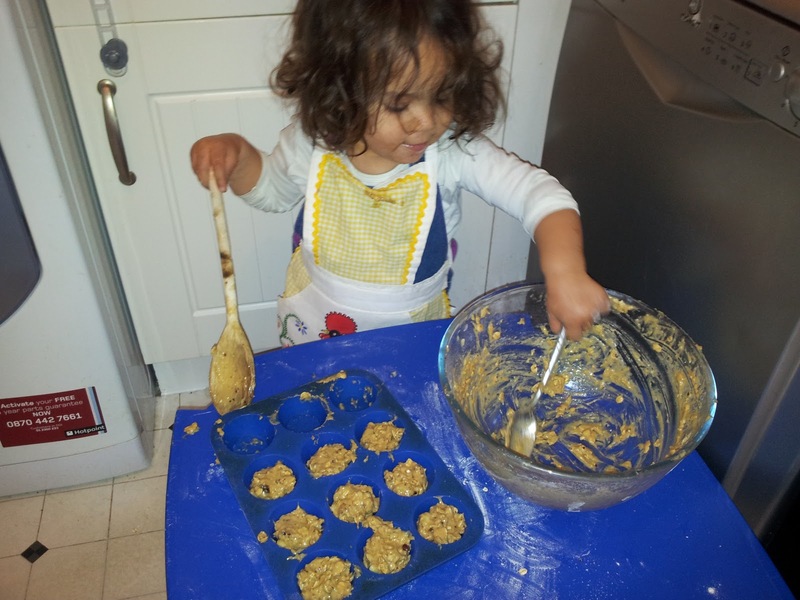 She made the biscuit mixture herself, I rolled, she cut, I baked, she decorated. Then we started on the coconut ice, but sadly, Mr Tumble is far more fun than mummy faffing about trying to figure out 3/4 of the recipe quantities as we didn't have enough coconut. And this is the bit where I finally talk about the recipes! I chose the biscuit recipe after scouring practically every baking book I own for a Christmas biscuit recipe that didn't involve ginger, oranges or boiled sweets. Fussy mother who doesn't like ginger, fussy me who's not a fan of orangey things (except Jaffa cakes although I wish they still did the lemon and lime ones) and couldn't face the idea of the mess I might make with the boiled sweets. I found the recipe in The Great Big Cookie Book. It's one of those books I picked up for a fiver in a cheap bookshop and thought "This will be really useful and I'll use it all the time" I bought it in 2003 when I bought my first house and this is the first time I've used it. The biscuits are very shortbready although crunchier due to the thinness of the roll (3mm). I went for all out lemon flavour with lemon icing but in all honesty they really don't taste that festive. Far more summery if you ask me. But nice. And so beautifully decorated by my gorgeous girl. The only thing that disappointed me was a) they lost their shape a bit when cooking and b) the recommended glaze had raw egg white in which I obviously can't use with a 21 month old so I just used good old lemon glace icing. With an electric mixer, cream the butter until soft. 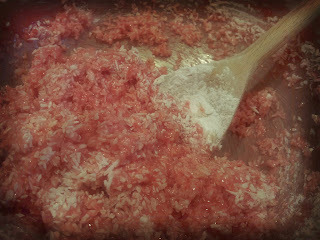 Add the sugar gradually and continue beating until light and fluffy. Using a wooden spoon, slowly mix in the whole egg and the egg yolk. And the vanilla essence, lemon rind and salt. Stir to mix well. Sift the flour over the mixture and stir to blend. Gather the dough into a ball, wrap and chill for 30 minutes. Preheat the oven to 190c/375F/Gas 5. On a floured surface, roll out until about 3mm thick. 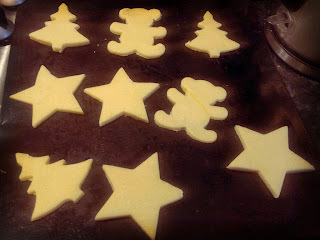 Stamp out shapes or rounds with flowered cookie cutters. Bake for about eight minutes until lightly coloured. Transfer to awire rack and leave to cool completely before decorating. Mix the icing sugar and lemon juice to a consistency that coats the back of a spoon. 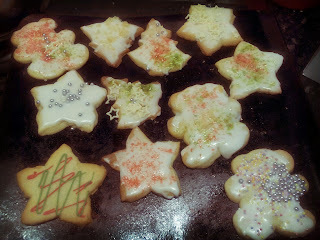 Use to coat the biscuits and then decorate with sweets. I picked out Dan Lepard's coconut ice the other day as it's one of the first things I ever remember cooking with my mum. We used to make all kinds of sweets when I was little as she was forever manning stalls at fetes and fayres as Brown Owl or to help out at my school. Back then we used condensed milk and icing sugar - she showed me the recipe book the other day but I can't remember for the life of me what it's called. Dan's recipe, however uses marscapone and fresh raspberries. I had a little tub of pureed raspberries from my garden in the freezer so they worked really well as they had far more taste than shop-bought ones have at this time of year. It lends a really fresh taste to the coconut ice. You don't really notice it at first but as the tooth-tingling sweetness disappears, suddenly you're left with the taste of summer dancing on your tongue. It's also very soft. I remember the coconut ice my mum used to make could often feel like you were going to crack a tooth when you bit into it. But this is like diving into a Bounty bar. Beautiful. Sadly it doesn't say how long it keeps, but judging by the flavour, I figure this is immaterial as nobody will leave it hanging round long enough to find out when it's past it's best. As always, highly recommended and will be a great gift for the visitors over Christmas. I also didn't have quite enough coconut and my tin was slightly too big for the original recipe, but I was saved (once again) by Lakeland's amazing foil lined parchment. Honestly, this is brilliant stuff and every baker should own some. It allowed me to fashion a container within my tin to just over half the size of the tin and happily retained its shape once the coconut ice was pressed in without the divider falling flat and the contents tipping everywhere. Line an 18cm sqaure tin with non-stick baking paper. Make the white ice first by beating half the sugar with the marscapone until you have a smooth runny paste. Stir in the coconut and remaining sugar, mix well then press into the bottom of the tin. Pack the mixture well and smooth the top. Squish the raspberries with the marscapone and half the sugar until smooth. Then stir in the coconut followed by the last of the sugar. Spread this carefully over the white ice until you have it even, then press it down firmly with a spatula and your figers. Loosely cover the tin, with the top of the ice exposed to the air slightly, and leave overnight somewhere cool to firm. The following day, lift out of the tin by lining paper and cut into pieces.